When Janice walked into Bible class everyone stepped aside. If Janice was in a good mood and got her way class went well. If not she would push kids out of their chairs, tease them about their looks or call someone stupid. When the teacher asked Janice to step into the hall, she rolled her eyes and said no. Janice’s bullying hurt others but it also kept her from learning about the love of Jesus. As a teacher you can help children who are caught in the world of bullies. • Bullies need to feel powerful to feel good about themselves. • Bullies seek attention because they may feel lonely and unloved. • Bullies may have role models who teach them to be tough and greedy. • Bullies choose to intimidate others because sin is part of their human nature. When all we tell children is to ignore a bully we may be encouraging a victim mentality. • Let others go first and stand in the back of the line. • Stand with shoulders back, head up and look the bully in the eye. 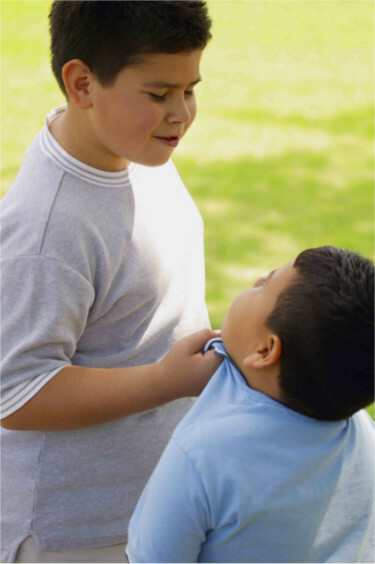 Bullies tend to pick on kids who look vulnerable. • Keep friends and allies close. • Tell the teacher or school counselor. • Pray for God’s protection and the bully’s salvation. To a bully, bystanders are like the audience at a play. Bystanders can cheer the abuser or boo the villain. Teachers in Janice’s church had a goal to understand, appreciate and value every child. So they vowed to show Janice the empathy she needed to develop in her life. The class talked about peacemaking and resolving conflict. On the bul­letin board they created a “word wall” that contrasted cruel and kind behaviors. In stories about Daniel and Joseph they discussed the bully, the victim and the bystanders. Janice eventually discovered that bullying was not cool and church became a lot more fun for everyone.